which translates into Fresh Beans with Olive Oil. 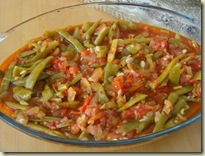 This entry was posted in Expat, Fast food, Recipe, Turkey and tagged Expat, Turkey by Jules. Bookmark the permalink. Yum! That looks so good. I love fresh green beans so I’ll definitely give this one a try. Thanks for linking up with Weight Weight Wednesday on Simply Frugal Mom. Great! Thanks for putting the invite out!